Dee and Phoebe are happy and healthy, loving time together at home. Phoebe is 5 weeks old now and looking gorgeous! Thank you to everyone for your continued well wishes. Our Chiropractor, Rebekah Tho, is focusing on sleep at the moment with lots of parents and kids trying to catch up on some missed hours over the break! The holidays are a perfect time for good sleep on a good pillow. It is so important to sleep with your neck supported and the CC team believe this so much that we are offering a complimentary pillow fitting! We would love to see more people feeling well rested after a great night's sleep. 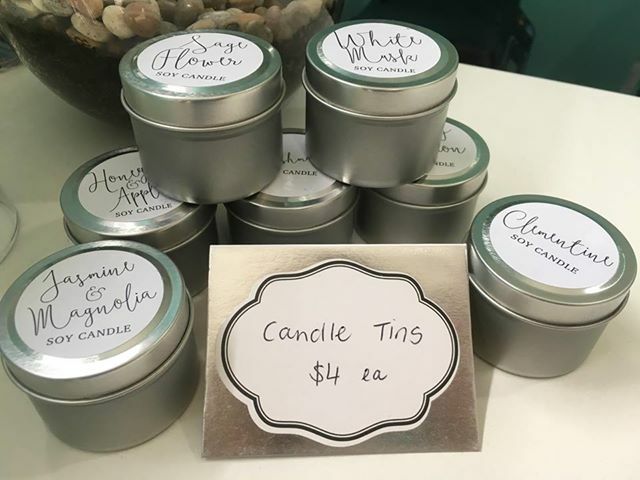 ​Kym has made up some more soy candles with all new scents that are available now. Spoil yourself or a friend this break with a little gift for only $4. Pop in to pick one up from our front desk. Congratulations to Deanne and her husband Brent on the arrival of their beautiful baby girl Phoebe Amity Spranklin. Phoebe was born on Sunday 19th August 2018 around lunch time. The new parents are loving their little girl and all the joy she brings. Rebekah Tho will be the only Chiropractor at our clinic while Deanne is on maternity leave. To book an appointment with Rebekah make sure to give us a call on 3172 7337. We wish Brent, Deanne and Phoebe all the best! In January 2018, Dr Scott Bevz will be joining Hands on India alongside 35 other chiropractors in Siliguri, West Bengal. Hands on India (HOI) is a unique charity run by Australian Chiropractors. For the past 12 years, the HOI team has travelled to the far North-East of India to provide “hands on” chiropractic care, and basic medical care to the Siliguri region and its surrounding communities. ​Much of the region works either on tea plantations, picking 20kg bags of tea, or breaking river stones by hand to sell for the creation of roads and buildings. On average this lifetime of hard labour brings in $1-2 per day and leaves many with musculo-skeletal aches, pains and problems. Child-labour rates are high and there is very limited access to basic health care. HOI will return to Siliguri in January 2018 for their 12th trip. Over the course of two weeks they will stay as guests of the Seva Kendra Mission travelling to surrounding areas where they will set-up temporary clinics and provide care. This time, there will be a team of 36 chiropractors, including our very own Scott! All of the team members are volunteering their time, paying their own travel expenses and working hard to raise funds to support community projects, improve the communities overall quality of life, and help break the cycle of poverty. Please note 100% of all funds raised goes directly to providing care to the region; setting up temporary clinics, funding 7 primary schools with 700 children and supporting over 2000 women in microeconomics and Women’s Empowerment projects. Donations can be made in the clinic or at gofundme.com/handsonindia. Every dollar helps, thank you for helping make a difference to so many. It can be very tempting to head straight for the couch and put all moving on hold when that all-too-familiar low back pain decides to strike. But as always, we're here to tell you otherwise. In the wise words of Ludacris - MOVE! Give these exercises a go at home and we can check your technique next time we see you. If these movements are painful, be sure to get in touch with us before adding them to your daily routine. ​With knees and hips bent, gently sway your knees from side to side. ​Simple, right? These two activities will introduce flexion and extension of the SIJ an rotation into the lumbar spine helping to warm up (and wake up) muscles of the low back. ​Remember - not all back pain is alike and the above should serve as a guide. There is emerging, high-quality evidence in favour of chiropractic care and LBP (and if you're following us you probably already know the benefits first hand), so come visit us in the clinic and we can check your form and make specific recommendations for you. ​In the meantime, grab your active wear and schedule in some 'me' time today! Meet Jordan - Our Remedial Massage Therapist! We are very excited to announce that we have a part-time remedial massage therapist joining the Cracknell Chiropractic Team this September! Jordan Haswell is passionate about sports and general wellbeing, with health and fitness being a big part of his everyday life. He believes this lifestyle optimises results for each and every client he treats. Sydney Roosters, the St George Dragons and the NRL Allstars. During this time, he also had the opportunity to work alongside some of Australia's premiere performance coaches. ​Whether you're suffering from a sporting injury, everyday aches and pains, or would like to support your Chiropractic care, Jordan's remedial massage therapy will help you function and feel better! If you'd like to book an appointment with Jordan, please give us a call on 3172 7337. Over the past 50 years there has been a shift in the way we use our bodies. We're working smarter, not harder - especially as adults. Our children are encouraged to pursue a healthy and active lifestyle while going through school but for most of us, when high school ends, so too do our sporting pursuits. ​By the time we've sat down to eat, driven to work, sat down at work all day and sat down some more to watch Netflix, we can be sitting down for just about every waking moment of our adult life! This shift in the way we use our bodies has led to an increase in sitting-related musculo-skeletal conditions. Furthermore, studies have suggested that prolonged sitting is a risk factor for obesity, diabetes and cardiovascular disease, even if we exercise. So what can we do? ​This is a question that pops up almost everyday - how should I be sitting at work? What is the ideal work posture? After reviewing the literature, and having our lovely receptionist Catherine snap some photos, I can safely say that I am not leading by example. Looking at the photos above, we can see that either my stool is too high or my desk is too low. So I pinched the receptionists chair for a much more comfortable set-up, which can be seen in the photo below. 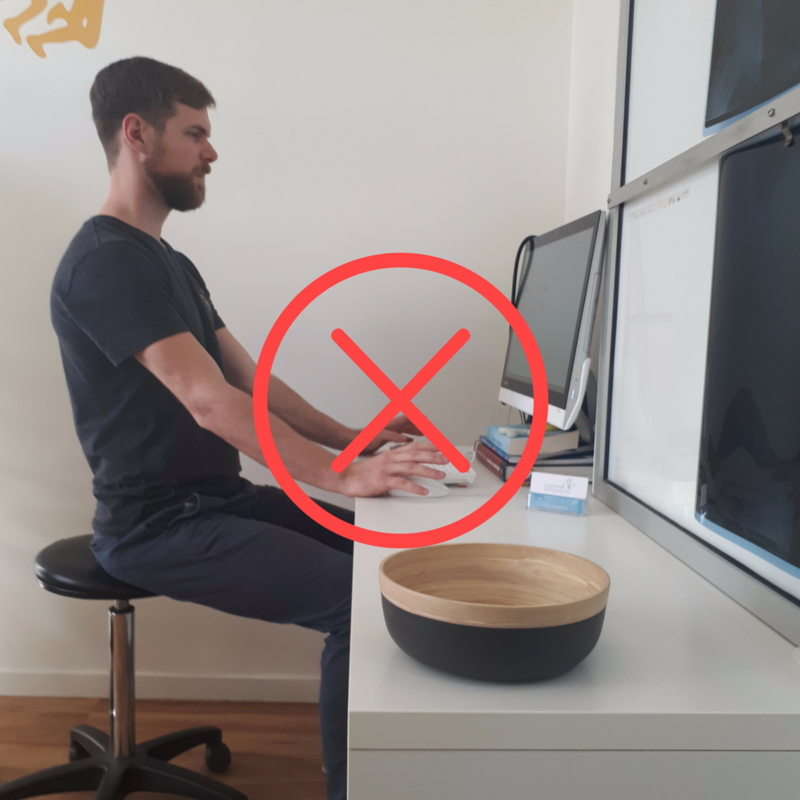 Even with the ideal desk/chair set-up, no posture, no matter how good can be maintained for more than 15-20 minutes before small adjustments will be required. For this reason, mixed tasks involving sitting, standing and moving around are required to maximise comfort and minimise the risk of musculo-skeletal injuries and decrease the risk of obesity, diabetes and cardiovascular disease. Give yourself a postural break, grab a colleague and snap a photo to see how your work posture really looks. Huysmans, M. A., et al. (2015). "Is Sitting Too Much Bad for Your Health?" Ergonomics in Design 23(3): 4-8.
van der Ploeg, H. P., Chey, T., Korda, R. J., Banks, E., & Bauman, A. (2012). Sitting time and all-cause mortality risk in 222 497 Australian adults. Archives of Internal Medicine, 172, 494– 500. Hennfng, R. A., et al. (1989). "Microbreak length, performance, and stress in a data entry task." Ergonomics 32(7): 855-864. McLean, L., et al. (2001). "Computer terminal work and the benefit of microbreaks." Applied Ergonomics 32(3): 225-237. McPhee, B. (2005). Practical Ergonomics, Coal Services Health and Safety Trust. O'Reilly, M., Finder, B., Werrell, MK. (2007). 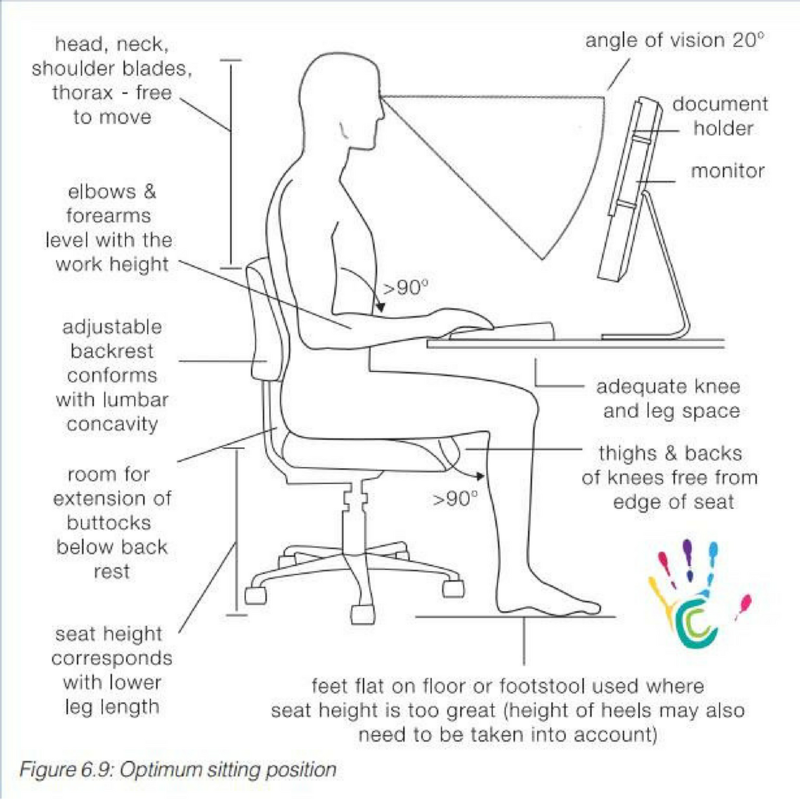 An Ergonomics Guide to Computer Workstations, AIHA Press. 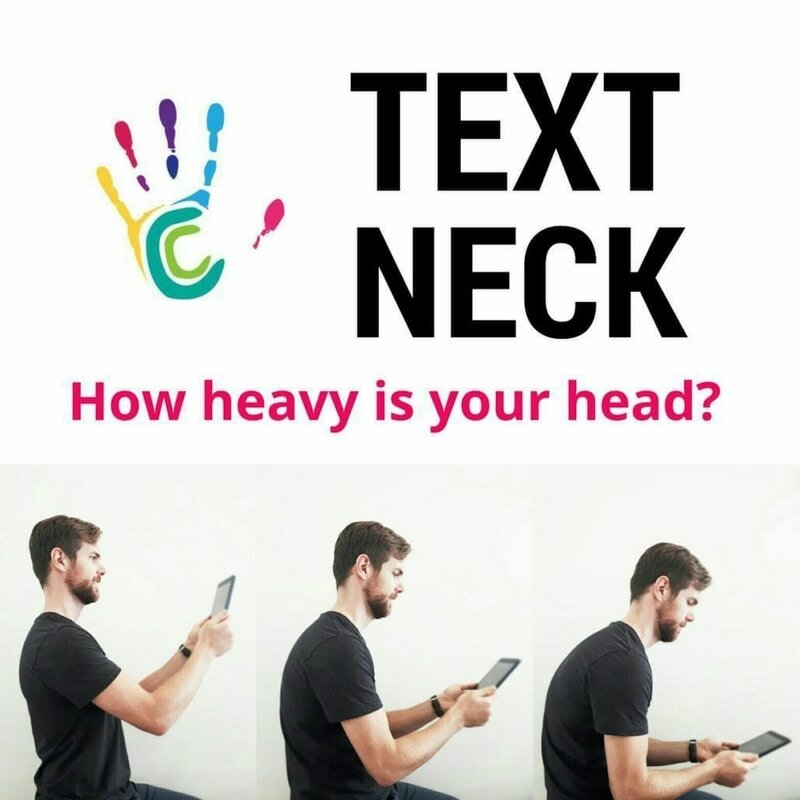 Text Neck: How Heavy Is Your Head? 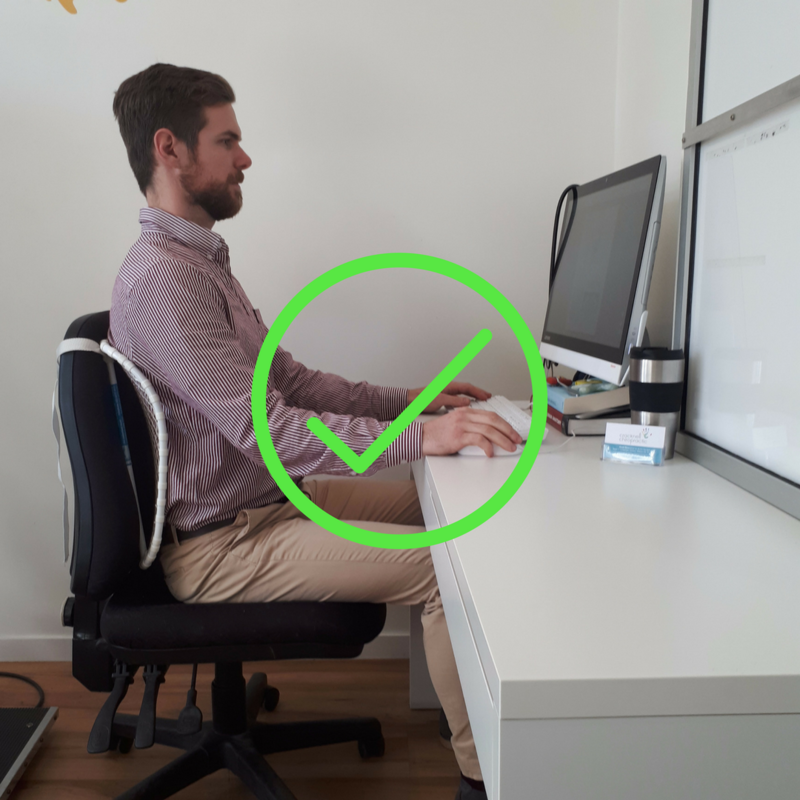 From reading eBooks on your tablet to catching up on text messages after work, it is often easy to get carried away and forget about your posture. As mobile devices become increasingly prevalent in our day-to-day lives, so too does Text Neck. Text Neck is a term used to describe the neck pain and soreness commonly experienced after spending long periods of time in a hunched over position looking down at a mobile device. Causing everyday pain and discomfort, we'll tell you some simple measures to prevent this strain on your spine. 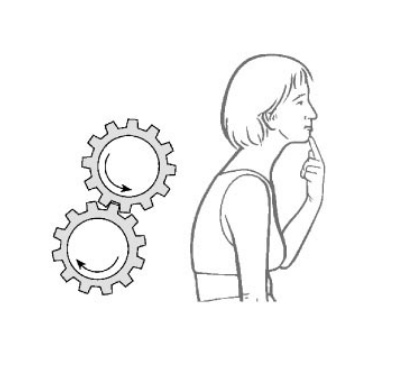 For every centimetre of forward head carriage, the muscles of our neck and back have to work harder. Kapandji quantified this in his book, (Physiology of the Joints, Vol 3) stating that every inch (~2.5cm) of forward head posture can increase the weight of the head on the spine by 10lbs (~5kg). If we apply this to the photos on the right, my head would weigh approximately 5kg, 10kg and 15kg (from left to right) so do yourself a favour and bring your phone or tablet up to eye level or better yet, put it back in your bag! 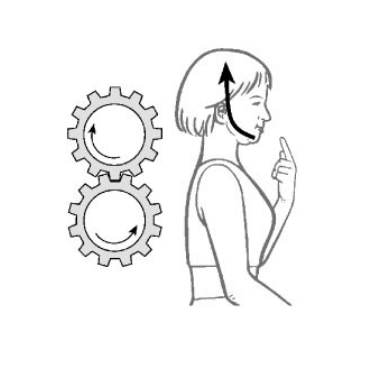 A simple exercise to strengthen the DNF (deep neck flexors) and relieve symptoms associated with Text Neck is the beginner chin tuck as described by Leibenson. The images on the left are modified from his article titled Self-help Advice for the Patient. Check out this link for some further reading on postural retraining and its effectiveness on treating spinal dysfunction. Chiropractic care has been a part of the Olympic games for over 40 years and today athletes of all kinds are reaping the benefits. Take Usain Bolt - an eight-time Olympic gold medalist who can run 100 metres faster than most of us can tie our shoelaces. But being the fastest man in the world can't come without the occasional setback (or two), right? From injuries to simply enhancing his performance, Usain Bolt uses chiropractic care as an essential part of his strategy to remain in great shape. We may not be able to make you lightning bolt fast, but through the application of evidence based patient centered care, we can certainly help you achieve your fitness goals and/or get you back on the field as soon as possible. Your initial consultation will begin with a diagnostic triage through orthopaedic, neurological and chiropractic testing with the short term goals of treatment focussing on reduction of symptoms (such as pain, decreased mobility and changes in sensation). From here we will work to prevent re-injury by identifying and addressing the causative factors through sport-specific and functional testing. This treatment may include; soft-tissue techniques, balance training, motor pattern correction, sport specific rehabilitation and patient education. My training and experience both on and off the field have given me an insight into the physical requirements of the body and the common injuries associated with sporting pursuits. Communicating with your coach or personal trainer will help put us all on the same team - getting you back in the game as soon as safely possible. If you have any questions for Dr Scott or would like to make an appointment, please call us on 3172 7337 or visit our website. Loudon JK, Reiman MP, Sylvain J, 2013, The efficacy of manual joint mobilisation / manipulation in treatment of lateral ankle sprains: a systematic review, Br J Sports Med 2013;0:1–6. One of the most common statements we hear in clinic is, "I don't know what happened, I just woke up like this, I must have slept funny." Likelihood is you didn't do sommersaults in your sleep or anything else funny for that matter. Symptoms are more often than not just the tip of the iceberg of the actual cause. Chiropractors can help you find the cause of your problem. Check out this video to help explain this concept further.